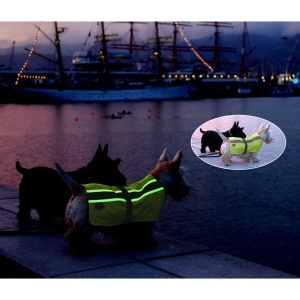 Flecta Vizlite DT Dog Jackets absorb UV light from any source (the sun or a bulb) and work like a battery to store the absorbed light. When there is no more light to absorb (in darkness), the stored energy is emitted as an afterglow which remains visible to the human eye for upto 8 hours thereafter. To charge simply open the jacket and lay onto a flat surface, ensuring reflective stripes are facing towards the light source. Charging time is 5 minutes in sunlight, 8 minutes in dusk and 10 under artifcial lighting. Flecta Vizlite DT Dog Jackets provide high visibility in all light conditions. Incorporated between the inner and outer fabric is a layer of Flectalon thermal insulation, proven to reduce loss body heat by up to 95%. 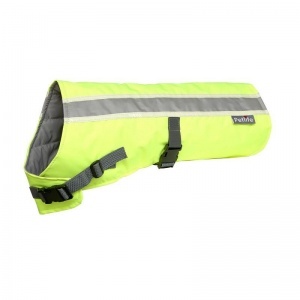 A Flecta Vizlite DT Dog Jacket is showerproof to help keep your dog dryer for longer.